We may send you periodic newsletters regarding the topic that you have signed up for, for example the Free School, The Messenger, to share news, updates and notifications regarding events, etc. We will do our best to personally respond to your questions from email and through forms on our web sites. We will not sell your information to a third party or use it to solicit to you. This website is accessible to the public and although we endeavor to keep your information as secure as possible, others can sign in to this website and may see your profile information if you have made it publicly viewable. We utilize web analytics data to better understand how users engage with our site. We offer the information on the site as-is without any warranties, and we do not take any responsibility for actions that people may take as a result of the information presented. The Society will not be held liable for any actions taken by users on this site including, but not limited to, medical decisions, career decisions, end-of-life decisions, relationship decisions or any other action which may be considered harmful or negligent. You cannot post material or use language on our web site that is harmful or offensive to others. Action will be taken to remove any language that encourages racism, sexism, religious bigotry, hatred or physical harm of any kind. We are not responsible for any material posted on the site by visitors, and will try to moderate in a timely manner any prohibited content. Any content posted by visitors to the site becomes the property of The Society to be used, potentially, for marketing and outreach purposes. You may not impersonate or falsely represent your identity using this site. You may not try to hack the site or slow down the site through DDoS attacks or thru malicious software injections. You may not use the chat, private messaging or activity feed of the site to send unsolicited messages, emails or instant messages to others. You may not post advertisements or solicitations for other companies or organizations on our sites without prior written permission. You may not post material or content that encourages illegal activity. You may not republish Revelations and re-word or re-phrase this text on any other media that exists now or in the future (web sites, newspapers, TV, etc.) without expressed written permission from The Society. All quotes taken from this web site must be made verbatim and with attribution, unless you have received prior written permission from The Society. Video content displaying or contained on the site cannot be downloaded, re-hosted, or embedded anywhere else without expressed written permission from The Society. 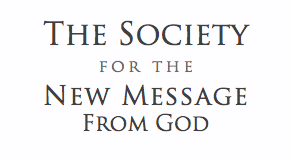 The Society holds all copyrights and ownership rights to the New Message materials contained on this site. All rights are reserved. Violation of these terms and conditions may result in the deletion of your account and any online content stored on our site and may result in legal action against you. We reserve the right to restrict access to the web site to any person, software client or group we deem is acting inappropriately on our site. We do not claim that the content and functions of the web site will be error free and available continuously. We will not be held liable for any downtime or unavailable content for any reason, technical or otherwise. We will not be held liable for any malfunctions on the site that may result in lost content. While we will make best efforts to ensure the site is safe and virus-free, but will not be held liable for any viruses or harmful/malicious software which may be acquired while visiting our site. If any of the above are objectionable to the user, they may elect to no longer use this site. The Society for the New Message retains the right to change these terms and conditions at any time with no prior notice.